Since 2006, Doorway Into Light has been engaged in advocacy and educational programs in Hawaii, with families and professionals in the field, as well as actively engaged in direct, volunteer support of dying people, their families, their care-givers and those grieving the death of a loved one (pet or human). Since 2012, Doorway Into Light operates Hawaii's only nonprofit funeral home and it's only certified green funeral home. We also operate The Death Store, Hawaii's only community educational resource center and store for those who are living with a life threatening illness; lay and professional care-givers to the dying; those grieving the death of a loved one; those wishing to explore their own approaching death. We provide information on the rights, laws and choices for those approaching death, including hospice care, living trusts, wills, advanced health care directives, ethical wills, home funerals, ocean body burial, organ donation, home burial, direct burial and direct cremation. We seek to re-invent and revolutionize the funeral home and the funeral industry, transforming the “business of dying” and returning it to “sacred service”, bringing forth options for end-of-life care and after-death care that are holistic, environmentally sustainable, community and family based, and spiritually inclusive. We also work with community organizations, such as local hospices, hospitals, non-profits and religious organizations in growing and deepening care for the aging and the dying. ​We offer a certification program for Death Doulas and Ministers of Death. Doorway Into Light is a 501C3 nonprofit educational and charitable organization. 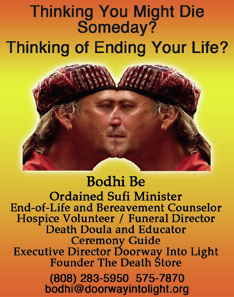 Founded by Reverend Bodhi Be, Leilah Be, and Ram Dass (Dr. Richard Alpert), Doorway Into Light is engaged in advocacy and educational programs on Death and Dying on Maui, with families and professionals in the field, as well as actively engaged in helping dying people, their families and care-givers. 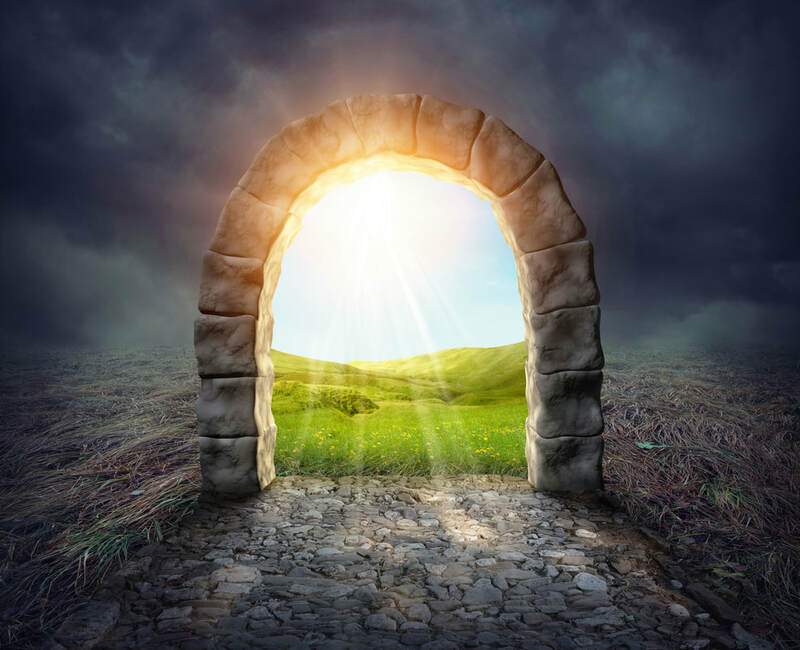 ​The founders of Doorway Into Light have extensive experience in assisting individuals and communities in the areas of dying and death. They serve as the Directors of Doorway Into Light and constitute an Executive Board. Bodhi Be, the Executive Director, is a teacher, guide and ordained minister in the universal Sufi lineage of Hazrat Inayat Khan and Samuel Lewis. He is an independent funeral director, hospice volunteer, end-of-life and bereavement counselor, notary, ceremonialist, and the founder and president of Doorway Into Light’s The Death Store. He is happily married for 32 years, parent and step-parent to 5 grown children. 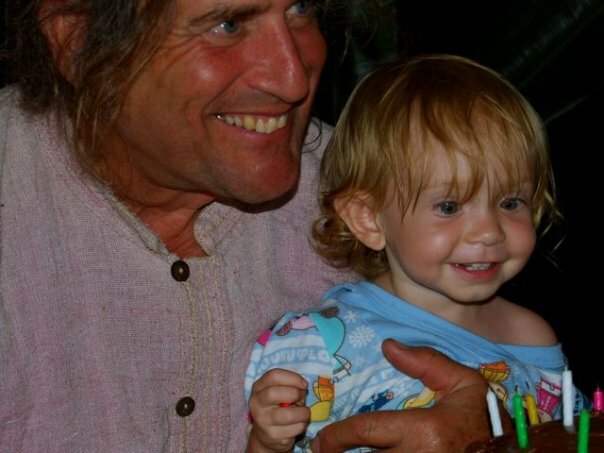 A grandparent, coffin maker, death doula and educator, artist, entrepreneur and organic homesteader on Maui, where he has resided for 40 years. ​Ram Dass, a Maui resident, has been a pioneer and explorer of awakened consciousness as well as one of its most important voices for over 40 years. Former Harvard Professor, author of "Be Here Now", 'How Can I Help? ", "Still Here", and many other books. He is co-founder of the Prison Ashram Project, the Dying Project, the Seva Foundation, and is on the Board and Faculty of the Metta Institute. Leilah Be is a teacher, guide and ordained minister in the universal Sufi lineage of Hazrat Inayat Khan and Samuel Lewis and the wife of Bodhi. A former director of a pre-school, she is an end-of-life and bereavement counselor, musician and gardener. Former founder/owner Rainbow Menehune Sprout Company, Maui Juice Company, Angel Scouts Children's Camp. An ordained minister for 32 years, facilitating weddings, baby blessings, house blessings and clearings, memorials, funerals and many other ceremonies. Together with his wife, Leilah, they have led meditation and Sufi Retreats worldwide and have been invited teachers to many other events for the last 25 years. Karima Morgan has 30+ years of experience as a counselor with children, youth, adults, and families in Canada and the US, including as a bereavement counselor in a hospice setting. She brings passion and expertise in art therapy and SoulCollage® to her role as a clinician and as an educator with caregivers and professional counselors. An orientation to strengths and resilience is central to her own life and her work with others. She co-facilitates a grief group with Hospice Maui. Sharon Lund, DD, since 1986 has passionately devoted and ministered her life to those faced with life-challenging illnesses, as well as people dying and their families after their loved ones have died. In 1997, Sharon died in the hospital and now comforts people by sharing her death experience and teaching people how to embrace the sacredness of life and death. She has traveled around the world giving presentations on these topics, has appeared on The Oprah Winfrey Show and has been featured in the November 2007 issue of “O” The Oprah Magazine. Gordon Becker, Phd, in Clinical Psychology; President and founder, Nebraska Zen Meditation Center; Former City Council member, Waterford, Connecticut; Faculty member Yale, UCLA, Univ. of Nebraska, Yeshiva Univ., Howard Univ., Long range planner for General Electric, Chief Life Scientist, General Dynamics Corp. ​Currently 92 years old.